Pavement on the Rossio Square (Praça do Rossio), Lisbon. Photo by Roede. How much does an urban environment affect our daily mood? All of those living in the cities would agree – quite a lot. 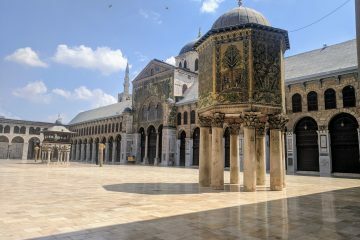 And if we also agree that a city that is carefully planned, built and embellished influences people in a better way than a chaotic concrete beast, we can say that cities that preserve their aesthetics remain not only precious but attractive and inspirational for locals and visitors alike. Applying this general story to a specific example, let’s turn to the aesthetic of Portuguese cities. Starting from Lisbon and all the way to Faro, these urban centers are testaments to a different time, as the grandeur preserved in palaces, squares and boulevards endures and protrudes the inevitable signs of decay. 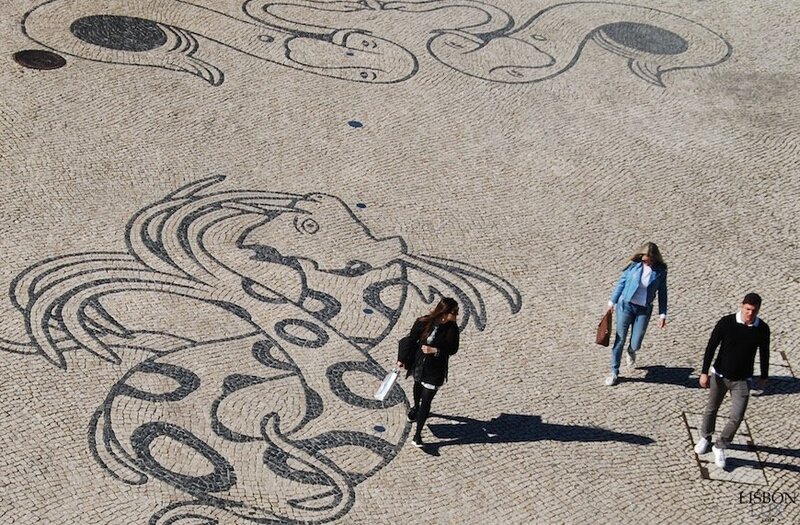 Although cities in Portugal may be a bit over-romanticized, there is one particular feature that makes them unique and especially interesting to a mosaic lover. This would be the irresistible calçada Portuguesa or Portuguese pavement, an exceptional way to decorate sidewalks and squares. Going back to the mood from the beginning of our story, all of the described experiences and millions of photos flooding the social media prove that walking over this type of pavement soothes the soul and transfers us to a different era when craftsmanship and beauty were considered common good. 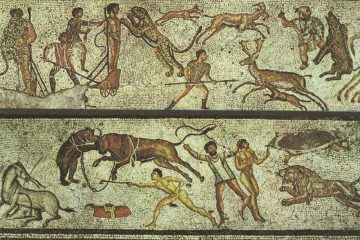 So, one might wonder – if Portuguese pavement has such a good influence, why not use it as an inspiration for other types of mosaic design and perhaps transfer a bit of the Mediterranean outdoors – inside. Parque das Nações calcada. Photo credit Lisbon Lux. The term calçada Portuguesa is used to mark a way of cobblestone paving characteristic for Portugal and countries that developed under its influence. Technically, it marks the use of regular sizes cobblestones, usually in black and white limestone, laid carefully and very tightly together. The neat production is not always there, but this contributes to the diversity of Portuguese pavement that ranges from very fine to amateurishly rough. Still, all the most important squares and spots around Portugal feature excellent craftsmanship in street paving and skilled Portuguese workers are often invited abroad to deliver the same result in cobblestone paving. If we look at the images produced by these talented pavers, it’s instantly obvious that calçada Portuguesa is, in fact, a form of street mosaic. 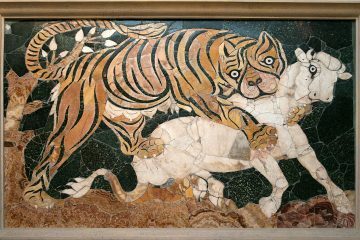 Looking back to the origins of fine street paving, we can find it even in Mesopotamia, and naturally, throughout Ancient Greece and Rome. 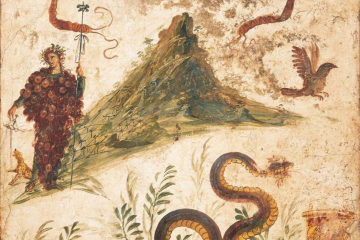 The most prosperous of them, Romans had the custom to pave vias connecting local materials and stones, and some of the techniques they developed are still used today, also in calçada paving. It’s no wonder that the Portuguese were originally inspired by Roman mosaics when this type of pavement was developed, in the 18th-century reconstruction of Lisbon, following a great earthquake. 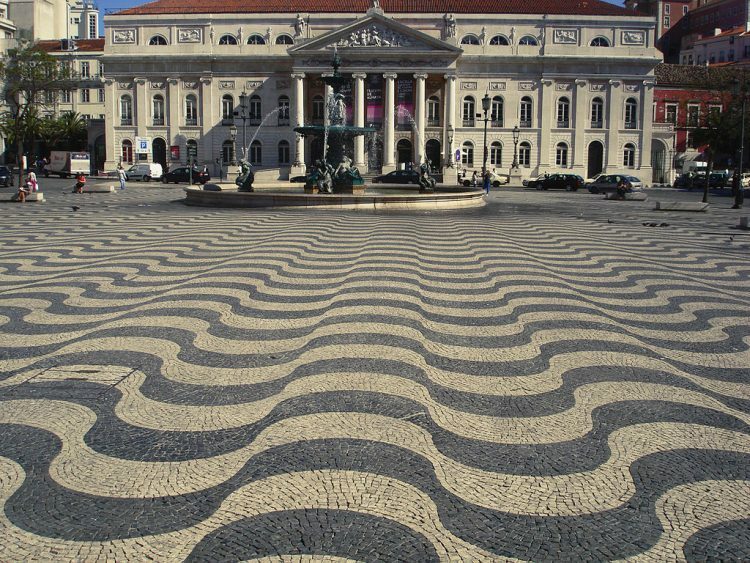 The first paved place was Rossio Square and its wavy patterned floor is attractive to this day. Finding the technique attractive and possible to achieve with local materials, the black and white pavement soon took over the entire city and became popular also in Brazil, Macau and other Portuguese colonies. Graphic and mostly abstract, Portuguese pavement does take on a form from time to time. Still, a lot of its older examples are made as a subtle memento of the country’s glorious maritime history. The shapes can shift from soft, wave-like and swirly, to sharp, triangular and utterly modern. While Lisbon is always mentioned as the place to go to if you enjoy vibrant pavement, the capital is not the only place where excellent examples of the calçada are found. The first and one of the largest examples of Portuguese pavement is definitely the Rossio Square in Lisbon. Covered with a sea of black and white waves, the pavement features a prominent pattern that almost has an effect of an optical illusion. This floor is so popular that it’s been reproduced in Rio de Janeiro and Macau, while the Lisbon version is intercepted by baroque fountains and side rows of trees. 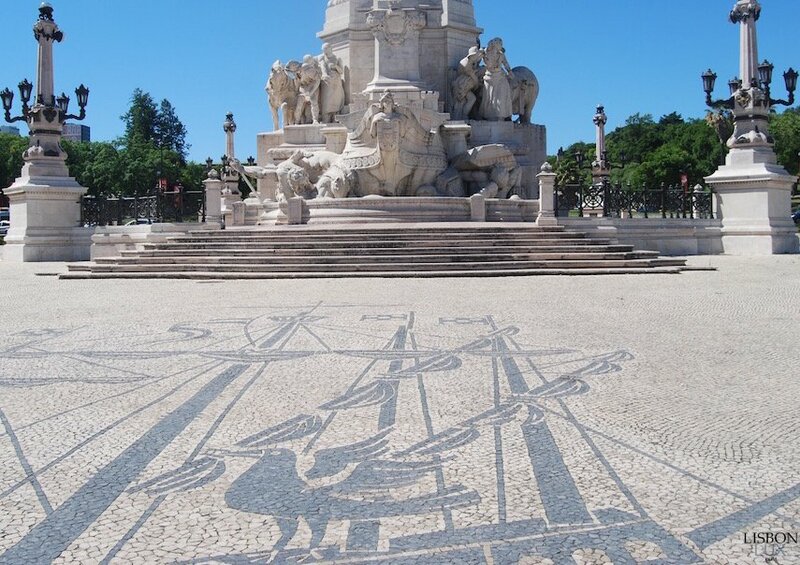 The modern Monument of Discoveries is dedicated to many Portuguese explorers and is encircled by the characteristic mosaic pavement. 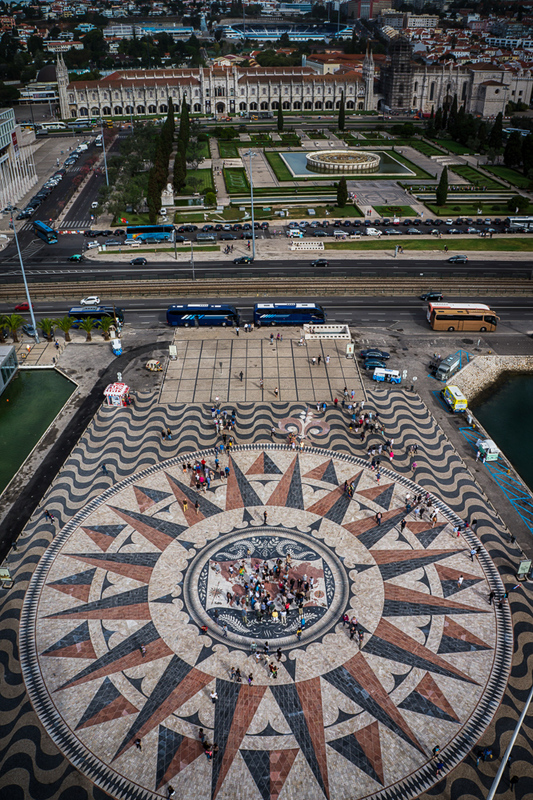 The images around the floor of the monument display a compass rose encompassing a world map, all surrounded by symbolic ocean waves similar to those found on Rossio square. Another modern example of the calçada shows how important oceanic history of the country is to the Portuguese. Stylized mosaic animals near the Oceanarium show a contemporary approach to the ancient paving technique at Parque das Nações. Even places surrounded by traffic, such as the monument to the Marquis of Pombal at the center of a roundabout, are laid on top of a layer of Portuguese pavement. Cobblestones here show the nobleman’s boat, a caravel and two crows sitting on it – a simple, yet elegant figurative solution in this technique. Coimbra also has one of the popular calçada Portuguesa examples, embellishing the floor around the University. 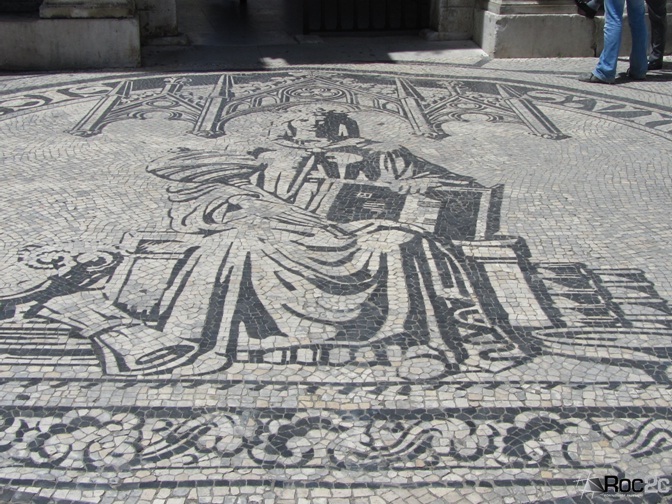 An image of the seal of the University of Coimbra is showing Queen Saint Isabel, the patron saint of the city, in a majestic posture and with gothic details, all executed in the black and white cobblestone mosaic. These are only the very few examples of the wonderful Portuguese pavement and we leave you with the desire to discover more. With different solutions and different tastes, an inspiration for reinterpretation can be found in every city of this maritime country, boosting the imagination to bring some of the street life indoors. Although it would be hard placing real cobblestones in a modern interior, calçada Portuguesa designs can be easily reproduced in a number of modern mosaic techniques, using either stone or ceramic tesserae, and in some cases even ceramic tiles. The timeless elegance of the black and white floor and neutral, yet impactful visuals adapt to a number of lifestyles, giving the interior that specific Mediterranean feel, with a very Portuguese twist. Portuguese pavement is perfect for floors covering entry halls, dining halls or halls in general, although it can be adapted to a bathroom or a kitchen, but with a careful consideration of the motif. The most important thing is to work with a talented artist who can suggest visual and spatial solutions, and transfer a dash of the true spirit of Portugal into your home.